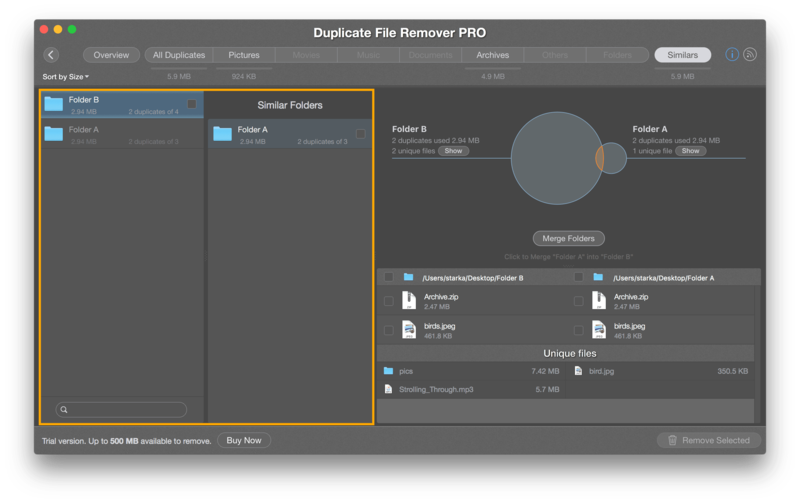 Duplicate File Remover Pro provides Cleanup Hints to remove duplicates for better space free up. Cleanup hints are displayed on Overview tab when scanning for duplicates is finished. Typically you can see up to 3 hints a time. Click the Refresh button to see more hints. You can follow the hints to start with the app easily, or might just switch to any file category and select duplicates for removal manually. Click a hint to preview the duplicate details, select duplicate(s) for removal. Suggested duplicate files (folders) will be displayed. 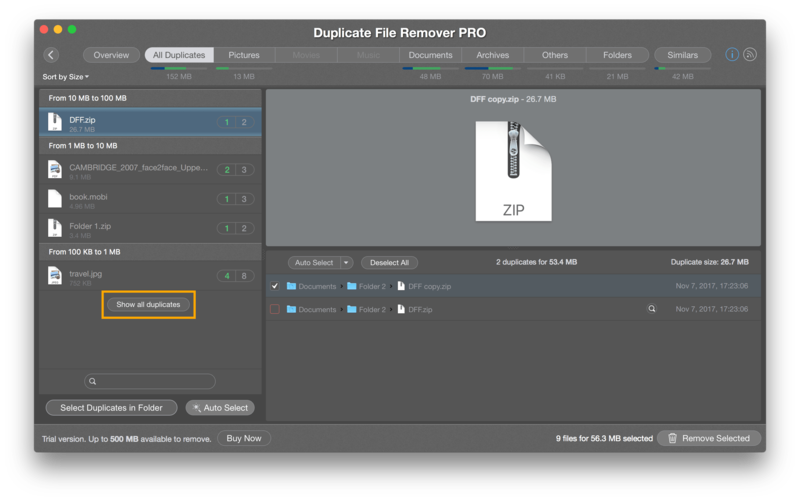 Click Show all duplicates button if you want to preview other files’ duplicates. Click Overview button to return back to the Overview panel. As a second step, we recommend removing of duplicate folders and similar folders. 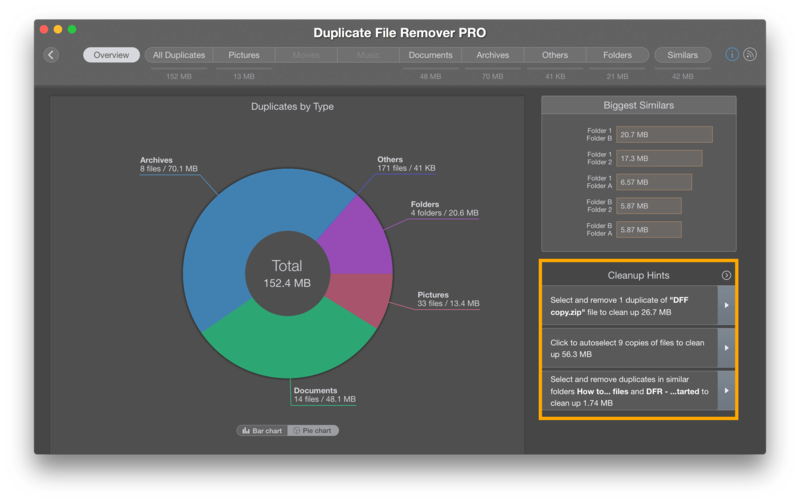 That’s greatly minimizing time spent on the processing of files, as usual, lots of file duplicates are the content of duplicate and similar folders. Switch Panel clicking on Tab for the duplicate items and Shift + Tab for a full list. Easily navigate via duplicates groups using ⌘ + Down or ⌘ + Up shortcuts. Press the Enter button for a quick select the f checkbox. By pressing on 1-9 number buttons you will select a duplicate file for removal. Vice versa ⇧ + 1…9 number will select all files except file with a number you have specified. By pressing Spacebar you will open QuickLook Preview of the selected file. Note: If you press arrow down or up, you will open QuickLook Preview for the next file. By pressing ⌥ + Down you will select the last element in the active list, vice versa, ⌥ + Up selects the first element. Note that the app has 3 active Panels for duplicates. First – list of all similar folders. Second – list of similar folders to a folder you have selected from Panel 1. Third – two file lists of folders selected from Panel 1 and Panel 2. Switch Panel clicking on Tab for selection of the next Panel and ⇧ + Tab for a previous one. The order is cyclic, i.e. if you click on Tab being in Panel 3, you’ll go to Panel 1. To switch between similar folders use shortcuts ⌘ + Up and ⌘ + Down to navigate via contents of the upper Panel. If you have Panel 3 active, you’ll navigate via content on Panel 2, if second is active, you change the selection in the first Panel. Note that you stay active on the primary Panel. If Panel 3 is active, clicking on 1 or 2 shortcut will select duplicate files in left or right folders respectively.